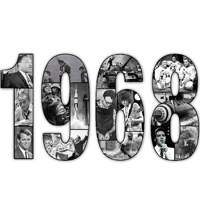 1968 has been called one of the most significant and turbulent years of the twentieth-century. Webster University's Cecille R. Hunt Gallery will present an exhibition commemorating the 50th anniversary of that tumultuous year with a few selected works created in 1968 by Eva Hesse, Robert Rauschenberg, Richard Serra, and others. In addition, there will be selected works created in 1968 including books, ephemera, protest images, popular media, “groovy” music posters, and album covers, all from the personal collections of neighbors of the Gallery. Webster University, as it was in 1968, is highlighted as that was the first year Webster became fully co-ed. Students and faculty in 1968 were also very much a part of the spirit of the times. The exhibit will run from Friday, Aug. 31 – Saturday, Sept. 15. There will be an Opening Reception on Aug. 31 from 5:30—8 p.m. with brief remarks given at 6:45 p.m. by Jeffrey Hughes, curator of the Hunt Gallery and professor in the Department of Art, Design and Art History. The Hunt Gallery is located at 8342 Big Bend Blvd. Regulars hours 10:00 a.m.-5:00 p.m., Tuesday-Saturday. All Hunt Gallery events are free and open to the public.